Please accept my blessings. 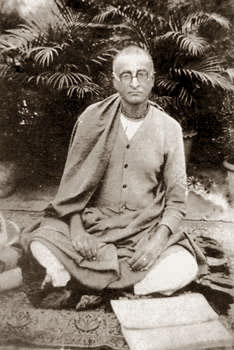 I was informed by some of my disciples at London, namely, Dhananjaya, Jai Hari, Rebatinandana Swami and others, that you so kindly have sent your car and drive to our place filled-up with fruits and flowers to offer to Radha and Krishna on the Disappearance day of my Guru Maharaj, Srila Bhaktisiddhanta Saraswati Thakur. I am so much pleased that you have thought of Him in that way, thank you very much. Surely you will become blessed by Him more and more. Yes, if one simply comes to that platform of spontaneous love for the spiritual master, then very quickly he will get love of God, or Krishna, and his all hankerings and lamentations of life will be finished. That is the process. Just like when two friends meet and, if the friend is also with his dog, the gentleman pats his dog first, is it not? So the friend becomes automatically pleased, his dog being patted. I have seen it in your country sometimes when I used to walk in the Regents Park early mornings. So it is like that, the spiritual master is the pet dog of Krishna, and if he is pleased so Krishna is also pleased. That is the process. "After many births and deaths, he who is actually wise surrenders unto Me, knowing Me to be the cause of all causes and all this is. Such a great soul is very rare." Mahatma means great soul, and such great soul is sudurlabhah, very rare. Great soul does not mean politician, or scholar, or so-called yogi, or any other so-called big, big man, famous musician, or scientist, or anything like that. No, great soul is one who understands that Vasudevah, Krishna, is the cause of all causes and all that is, and then surrenders unto Him. You are doing that, therefore I say that you are great soul, not because you have got some material name, fame or wealth. But that will vanish at the time of your death, so what good it is? But because you are serving Krishna in devotional loving mood, therefore I say great soul. There is one Bengali proverb that the person who is actually famous is the Devotee who is known by all other Devotees to be great. "Always think of Me and become My devotee. Worship Me and offer your homage unto Me. Thus you will come to Me without fail. I promise you this because you are My very dear friend." So to become the friend and the devotee of Krishna, that is required. Just become the pet dog, that is surrender. What is that friendship? At the end of 12th Chapter of Gita Krishna describes that the person who is very dear to Him, or His best friend, is one who is not envious but is a kind friend to all living entities, who does not think himself a proprietor, who is free from false ego and equal both in happiness and distress, who is always satisfied and engaged in devotional service with determination and whose mind and intelligence are in agreement with Me... He for whom no one is put into difficulty and who is not disturbed by anxiety, who is steady in happiness and distress... A devotee who is not dependent on the ordinary course of activities, who is pure, expert, without cares, free from all pains, and who does not strive for some result... One who neither grasps pleasure or grief, who neither laments nor desires, and who renounces both auspicious and inauspicious things... One who is equal to friends and enemies, who is equipoised in honor and dishonor, heat and cold, happiness and distress, fame and infamy, who is always free from contamination, always silent and satisfied with anything who doesn't care for any residence, who is fixed in knowledge and engaged in devotional service..." such person is described by Krishna as "very dear to Me." "There is no servant in this world more dear to Me than he, nor will there ever be one more dear." So that will be the supreme perfection of our existence, to come to that point of being best friend, best devotee of Krishna. And how is that? If we become simply engaged in His preaching work, trying with whatever talent or education or experience or material advantages we have got, to spread Krishna Consciousness message all over the world. That is the best friend of Krishna, that is Krishna's pet dog. 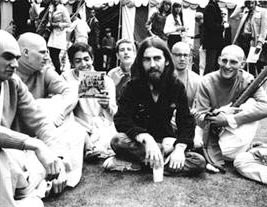 So I am pet dog of my Guru Maharaj, and you have helped him so nicely to push on the message of Lord Krishna or Krishna Consciousness Movement, and I am very much pleased by your serious and sincere attitude, so you will get all the blessings of my Guru Maharaj, that you may know for certain. And if you have ever got any questions or difficulties, I am always your humble servant, you may please write to me wherever I am. I have heard that your good wife, Patty is growing Srimate Tulasi devi there at your house with good success. That is another very auspicious sign. The Tulasi, she will not go to live with anyone non-devotee, and because she is growing so profusely, therefore she is giving you her best favour because you are best devotee, that is to be understood. Now go on with your chanting as much as possible, that will protect you from the attack of Maya, without any doubt. Just like if there is sunshine then where is the question of darkness? So Maya cannot remain in the presence of Krishna, therefore we chant always Hare Krishna to become freed from all attachment to Maya. I know you are very intelligent boy, and I like you very much, you are better than my own son, and I am so much pleased that you are displaying gradually more and more the qualities of becoming Krishna's pet dog as described above. If you have got any time, you may kindly write to me, or you are free to come to India to live with me for some time, as you like. Hoping this meets you and your good wife in the best of health and spirits.